One of the cheapest ways to buy grass-fed meat is in bulk. 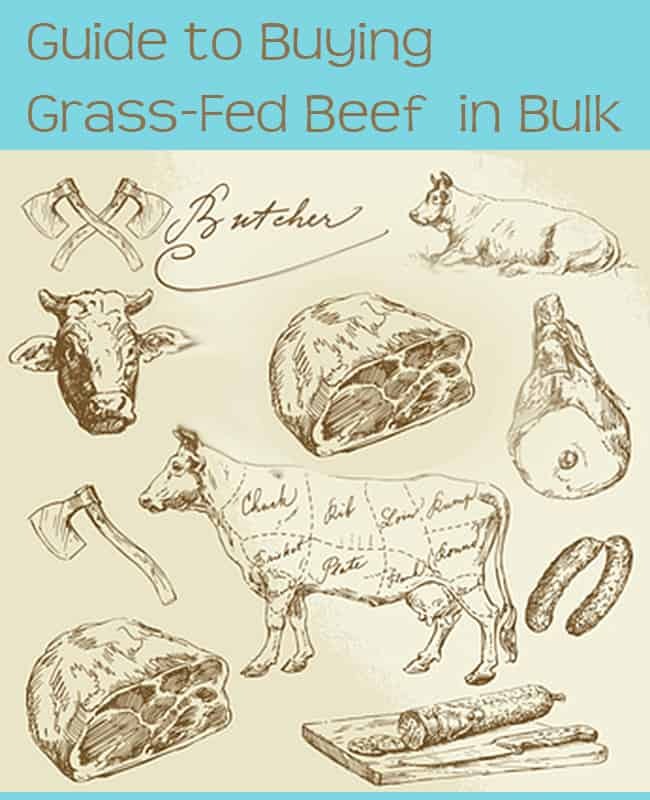 It can be daunting to find a farmer and figure out pricing and then, ahem, pay for it so I’ve creating this guide to buying grass fed beef in bulk . Prices really vary per farmer. I’ve seen it as low as $1.50/lb live weight to $5.00/lb carcass weight. When I was looking into buying 1/4 cow from my farmer, the final price including butcher fees was $848. We ended up with 115 lbs of meat so that’s $7.37/lb. I don’t know about you, but it is very difficult for me to save up that amount of money. Besides budgeting and setting aside money each week so we can afford this purchase every year, I also earn money with Swagbucks. Last year by using their search bar, I was able to get $400 via PayPal to help me pay for the bulk cow purchase. This is free money I was able to earn without really doing any extra work. Anyhow, so what are the benefits of grass-fed beef? The animals are not fed a constant stream of antibiotics, which is what happens with CAFO animals, because E. coli is now found in the intestines of most U.S. feedlot cows. No growth hormones are used, which can interfere with our own hormonal balance. The conjugated linoleic acid (CLA) levels in the meat of grass-fed animals are higher, and this helps us fight cancer cells, reduce clogged arteries and delay the onset of diabetes. Grass-fed meat is up to four times higher in vitamin E than meat from feedlot animals. Grass-fed meat has both Omega 3 and Omega 6 while feedlot animals have almost none of the good Omega-3 at all. Store-bought meat from feedlot animals is more convenient for many people because they can get it close by at their local supermarket and, especially if it is on sale, it can be cheaper than grass-fed meat. So, how do you go about finding Pastured Meat? Obviously the closer to your home, the better. There are several simple ways you could find a farm near you that sells their meat. Google “grass-fed beef/pork” and add your town/city/zip code. I Googled “grass-fed beef New York”. On the first page I got bigger, more commercial farms like Joyce Farms but if you want to deal with a smaller farm, go to page 4 or 5 of the results, where I found Herondale Farms. Local Harvest is a wonderful site for finding a source near you. Word of mouth, of course, is an obvious one, so keep your ears open and perhaps ask your local butcher. Find a farmers’ market which has a grass-fed meat vendor and haggle with him if necessary. Your local Feed Store is a great option where some small farmers in the area will advertise on the bulletin board. How does the pricing work when dealing with a farmer? A farmer will talk about the live weight of the cow, which is what it weighs while still running around in the fields. The average weight for a cow would be 1,000lbs. Depending on the farmer, this could cost you perhaps between $2.00 and $3.50 per lb live weight. Often pricing will be better if you buy the whole animal versus 1/4. You can help reduce the cost by buying a larger portion and splitting it with friends. We’ll take an average of $1.50 for this exercise as the farmer is asking for payment on Live weight which is different from the Carcass Weight. You will be given the carcass, which is what is left after the animal has been butchered. This Carcass Weight is usually 60% of the live weight so your carcass share will now weigh 150 lbs. At this point, you would usually take your meat to a butcher and he will hang it in a cooler for up to 3 weeks to deepen the flavor and tenderness of the meat. After this process, the meat has decreased in weight again by 60% (the take home weight). So now you will have 90 lbs of meat. $375 farmer +$100 butcher =$475 ÷90 (weight of your meat)= $5.27/lb. Is that a bargain for Grass-fed meat? Heck yes! Fantastic info on buying in bulk – thank you so much for sharing how to do it economically! Emily, It kinda depends on where you live. There are some amazing food buying clubs in Portland and I used to be part of the North Portland Food Buying Club when I lived in St. Johns. I seriously miss the heck out that group. The money I saved was insane. If you are in SE Portland – Check out Know They Food. They have produce boxes and access to every type of pastured meat you can imagine. They have a cafe which has killer breves too, lol. There’s also a buying club called I Dig Worms Buying Club on Facebook that connects people to local farmers. Thank you for the great information Kelly….I have been so intimidated by going in on a share but it seems more than worth it when you break it down to cost/lbs, hopefully I”ll find somewhere down here in Florida….I’ll certainly start looking now. Good luck and happy eating. Don’t be afraid to ask your farmer a million questions!